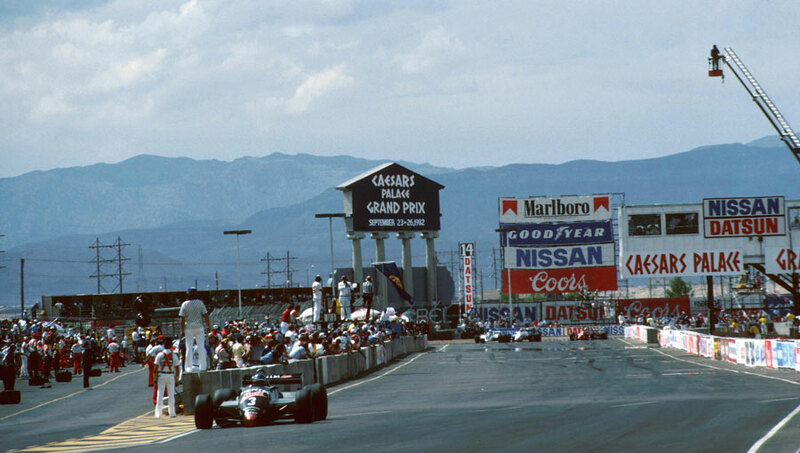 Keke Rosberg secured his one and only drivers' title in the last race of the season held in the car park of Caesars Palace Hotel in Las Vegas. Rarely can a championship have been decided in a less fitting or popular venue. Rosberg clinched the crown thanks to his fifth-place finish, meaning that although he won only one grand prix all season his steady accumulation of points, aided by the sidelining of Didier Pironi was enough. The race itself provided a surprising debut win for Michele Alboreto and gave Tyrrell its first success since Monaco in 1978. The weekend started with only John Watson able to catch Rosberg, but to do that he needed to win and hope the Finn finished outside the points. The Renaults of Alain Prost and Rene Arnoux (in his final outing before moving to Ferrari) again hogged the front row with Rosberg back in sixth and Watson a distant ninth. Arnoux and Prost swapped the lead before Arnoux retired with engine trouble after 15 laps. On the 52nd of 75 laps Prost, plagued by tyre vibration, was passed by Alboreto who had been playing a patient waiting game behind the Renaults. Behind him Watson was doing all he could to take the win he needed, rising from 12th to second despite the gruelling circuit taking its toll. "My head was bobbing up and down, the vibration was terrible," he said while admitting blurred vision had caused him to slow near the end when he realised he could not catch Alboreto. It did not matter. Rosberg, meanwhile, had settled in fifth, safe in the knowledge that was enough although he admitted that "the last ten laps were very long". "I can handle all this," he added as the press surrounded him after the race. "I am a workaholic and a happy time can only last two days, then it's back to work. I am a professional driver and life goes on." Alboreto's win was his first podium finish and left Ken Tyrrell delighted. "He is quick, consistent and mature for his age." Tyrrell had placed bets for an Alboreto win on behalf of all his mechanics at 20-1. But despite the media predicting great things, Alboreto only won four more grands prix in his 215-race career.